Currently undergoing testing in Spokane with Spokane Transit Authority, it has been confirmed that the BYD E-Bus is coming to the Tri-Cities next month. At this time, officials with BFT are still working on plans for where and when this bus will be running, but a press release should be put out towards the end of the month with that information. It has also been hinted that the ZEPS Bus, BFT’s current electric bus project, will be running at the same times as the BYD E-Bus, creating the opportunity to compare these two different technologies side by side. Pending the approval of the Board of Directors tomorrow, bus riders in Chelan and Douglas Counties will be seeing some new bus stop signs installed. Over the years, the old bus stop signs have become faded with age, and a large number of them have the route numbers listed in a haphazard fashion with little organization and inconsistent fonts. 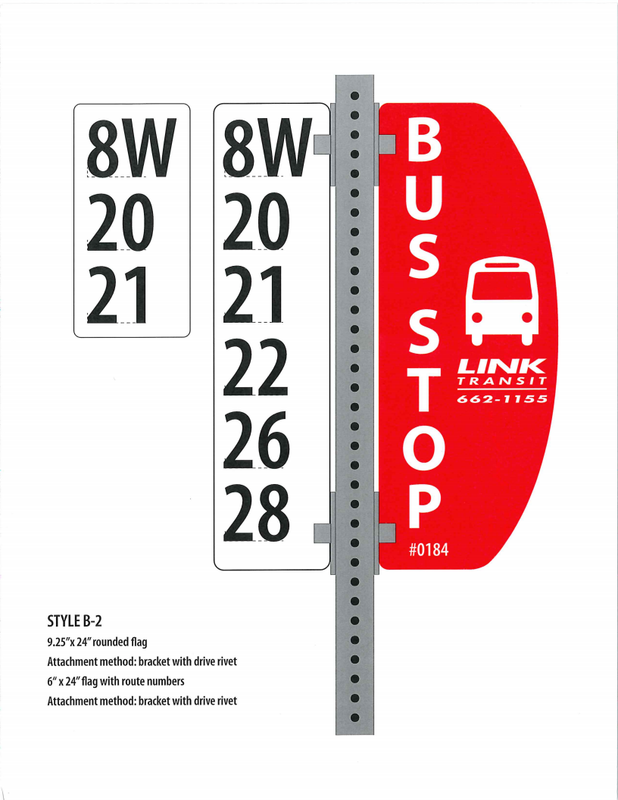 The new bus stop signs, an example of them seen at right, work immensely to address this issue, as well as gain added visibility and an overall better look. 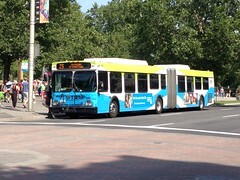 Approximately 620 of them will be installed, covering every city and bus route in the Link Transit system. The costs for these new signs is $26,511.71 (including WA sales tax), which covers the signs and all the installation hardware. As reported last week, Yakima Transit was looking in to the possibility of discontinuing the Yakima-Ellensburg Commuter and Sunday fixed-route service. Both services are largely funded with grants from WSDOT, and those funds are running out very soon, largely in part to higher than predicted maintenance costs in the case of the former. At the request of City Manager Tony O’Rourke, the vote was tabled as talks for new funding sources had picked up in the days since this was first announced. A meeting with officials from the involved parties and cities is tentatively scheduled for the end of the month, and this issue will likely come up again in the City Council meeting next month. In coverage from the Yakima Herald-Republic, it was mentioned that Yakima Transit and Hopesource had submitted a grant request to help purchase two new buses to run the route, so there may be hope yet. Back in December, Wenatchee Valley Shuttle moved their Wenatchee stop from Olds Station (Easy Street) to Columbia Station in Downtown. 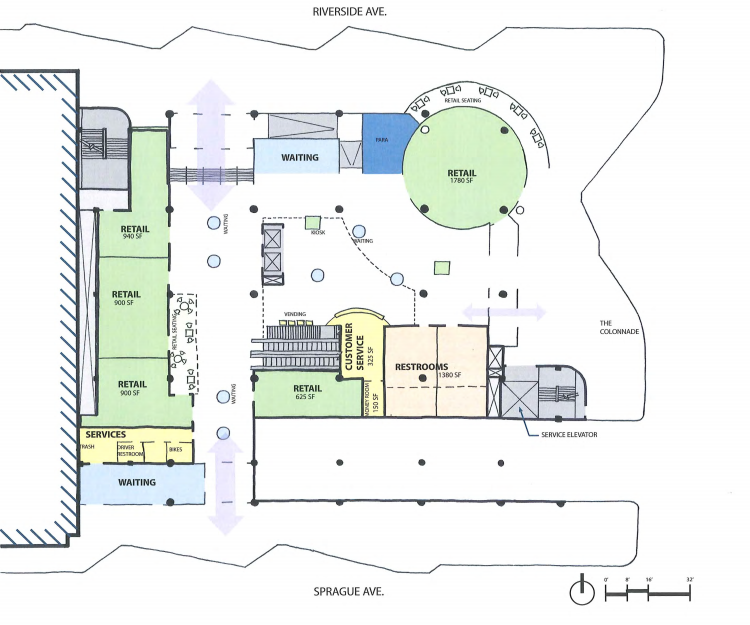 With Link Transit, Amtrak, Northwestern Trailways, and the Apple Line all serving the station as well, it’ll make it much easier to connect to the shuttle. Responding to rider demand, Customer Service will now be open on Saturdays once again (last being so before BFT started cutting services due to the recession). The Rider Information line will be open for phone calls from 8AM-5PM, which is also the same hours that the customer service building at Three Rivers Transit Center will be open. Along with the opportunity to get information in person, riders will also have access to the restrooms and waiting area during those hours. While the Ebus program continues to experience issues with the batteries, Link Transit has continued to hold on to their old diesel trolleys as backup vehicles. However, with the recent delivery of 5 new CNG-fueled Arboc Spirit of Mobility cutaways, they’re finally able to surplus the old diesel trolleys. Among the 5 being surplused, 3 of them (501, 503, and 506) will be sold to Pierce Transit, who will be using them on their seasonal “Get Around Gig Harbor” trolley service, which began as a demonstration service last summer. Each trolley will be sold to Pierce Transit for $13,724 each ($41,172 total). The other 2 surplus trolleys (504 and 507) will be sold to a brokerage service that deals in used trolley buses. All the funds from this bus sale will be used by Link Transit for future bus purchases, as the vehicles were originally purchased by their first owner, Milwaukee County Transit System, using FTA funds. 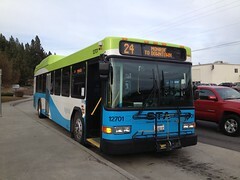 Needing to replace the 3 1991 Orion I’s being used on the SkiLink service and a 2004 Optima Opus which is obsolete (meaning parts are not available), Link Transit will be buying 5 used 29-ft Gillig Low Floors from Spokane Transit Authority for $11,000 each. Historically, Link Transit has purchased buses with one door only. However, as ridership has risen on the urban routes, the need for buses with multiple doors has become an issue. With the purchase of the 5 buses from STA, the Orion I’s and Optima Opus will be retired, and the older 29-ft Gillig Low Floors with one door currently in Link Transit’s fleet will be moved from regular fixed-route service to the SkiLink service. After the plan to route the Yakima-Ellensburg Commuter through Selah fell through due to large opposition from current riders, Yakima Transit officials have found a compromise. 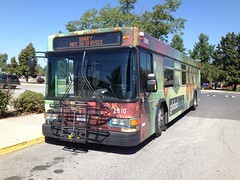 Beginning March 24, Route 10 will be extended north to the park-and-ride at Exit 26, next to the Yakima Firing Center. With the funds already being spent to improve a parking lot at Selah Christian Church for use as a park-and-ride on the original proposal, riders will instead be able to catch Route 10 there or anywhere else along the current route, and ride up to the firing center park-and-ride where they can transfer to the Yakima-Ellensburg Commuter. Regular fixed-route fares will remain the same, and the fare policy for the Yakima-Ellensburg Commuter will still apply to all riders regardless if they transfer from Route 10 or not.